NEW ORLEANS – A two-week stretch in the middle of February shook up the men’s race for The Bowerman, collegiate track & field’s highest honor. New faces joined the Men’s Pre-NCAA Indoor Watch List when it was released Thursday by the U.S. Track & Field and Cross Country Coaches Association (USTFCCCA), while others solidified their spots on the prestigious index. Michael Norman SO Southern California Sprints San Diego, Calif.
Also Receiving Votes: Josh Awotunde (South Carolina), KeAndre Bates (Florida), Rae Benjamin (Southern California), Joshua Davis (NC State), Jordan Geist (Arizona), Matt Ludwig (Akron). Two collegiate indoor records fell at the Tiger Paw Invitational hosted by Clemson University and two men had a lot to say about it: Grant Holloway and Michael Norman. Holloway kicked things off on the opening day of the meet when he broke Omar McLeod’s three-year-old record in the 60 hurdles. The Florida sophomore crossed the finish line in 7.42, which bested the previous mark by .03 seconds. Holloway became the 23rd man in world history to go sub-7.43 and first since France’s Dimitri Bascou in 2016. The following day, Holloway and three of his teammates notched the second fastest time in collegiate indoor history in the 4×400 (3:02.23). If it weren’t for Norman and his teammates from Southern California, that would have been the collegiate indoor record. Norman held off a hard charge from Florida’s Benjamin Lobo Vedel and split 45.35 on the final leg. All told, the Trojans got the baton around in 3:01.98, which also stands as the second fastest time in world history. Don’t forget about Norman did in the open 400 earlier in the day. Norman and Auburn’s Akeem Bloomfield waged an epic battle over two laps. The former won the race in 45.00 – the fifth fastest time in collegiate indoor history – while the latter was runner-up in 45.02, which tied the sixth fastest time in collegiate indoor history. Josh Kerr and Chris Nilsen stood out the following weekend at the NYRR Millrose Games and the Nebraska Tune-Up, respectively. Kerr tested his might against an ultracompetitive field in the Wanamaker Mile and nearly won the iconic race. The New Mexico sophomore fought his way up from sixth place over the final two laps and finished runner-up in 3:54.72, the sixth fastest time in collegiate indoor history. Nilsen continued to raise the bar 1,292 miles west in Lincoln, Nebraska. The South Dakota pole vaulter became the eighth man in collegiate history to clear 5.80m (19-0¼) indoors. Four other men on the Pre-NCAA Indoor Watch List – Texas Tech’s Trey Culver, Syracuse’s Justyn Knight, Texas Tech’s Divine Oduduru and UTEP’s Michael Saruni – didn’t post all-time marks since the last Watch List (Knight fell just shy of an all-time performance in the 3000), but continued their winning ways. The quartet combined for five conference titles with Knight winning two, as he swept the 3000 and 5000 at the ACC Indoor Championships once again. Speaking of hardware, Bloomfield (400), Holloway (60 hurdles) and Kerr (mile) all won league crowns in their respective events. 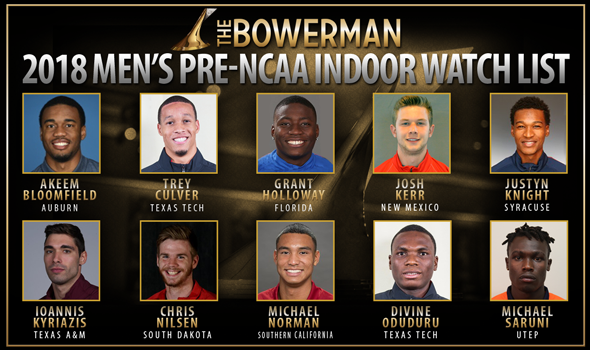 Six men received votes from The Bowerman Watch List Committee, but not enough to have their name on the Watch List: South Carolina’s Josh Awotunde, Florida’s KeAndre Bates, Southern California’s Rae Benjamin, NC State’s Josh Davis, Arizona’s Jordan Geist and Akron’s Matt Ludwig. The next Men’s Watch List will come out March 15 after the conclusion of the 2018 NCAA Division I Indoor Track & Field Championships in College Station, Texas.